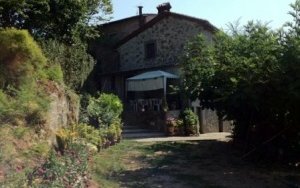 119 Twin properties with panoramic balcony in Vergemoli, Lucca. 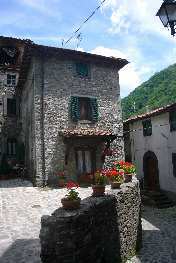 These are 2 adjacent properties, splendidly renovated, set in the picturesque village of Vergemoli. The buildings were renovated at the same time to a very high standard in such a way as to retain all the original features typical to this type of property. Both houses share a fabulously panoramic terrace paved with terracotta which overlooks the valley. Ground floor – entrance hall, living room, bathroom and staircase that leads up to the next level. First floor – very bright open plan living space with kitchen / dining and lounge areas. Second floor – one matrimonial bedroom and 2 single rooms. The property is finished to a high specification. This property differs from the other property in that it has more windows due to the fact that it has to external walls. Ground floor – entrance hall, large bathroom, spacious living space also used as bedroom and staircase that leads up to the next floor. First floor – open plan living space with terracotta tiles and original beams restored to perfection. Second floor – bright open plan living area with panoramic views used as lounge with a door that permits an independent access. Above this space is a mezzanine level used as a bedroom. Both these twin properties have gas central heating as well as fireplaces. They are insulated and share similar finishes typical of the Tuscan tradition.